Hurkmans ET B.V. offers total concept embryotransfer, based on many years of experience combined with the newest techniques available in bovine reproduction and selection. Hurkmans ET B.V. is a European Union Certified embryo production team (NL126), with laboratory facilities approved for production and processing of bovine embryos. 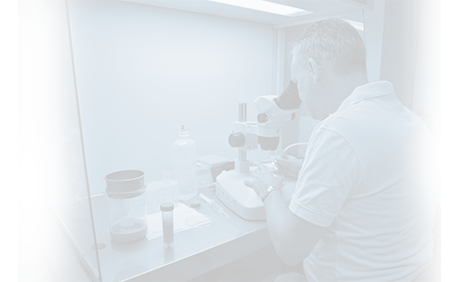 We can store produced embryos in our certified embryo storage and ship your valuable embryos to destinations worldwide on demand. We also can import embryos from abroad and facilitate storage, or transfer on demand in our own recipient herd. New techniques provided at Hurkmans ET Donor station are OPU (ovum pick up) and IVP (in vitro production). We offer housing facilities for donor cows and heifers, and clients have access to recipients at our recipient herds located near our donor and laboratory facilities. A personal approach is obvious to us, and we can provide advice and assistance on ET OPU and IVP issues. Also guidance on the commercial exploitation of your donors is a skill we can offer you. Our mission "Helping to make your genetics more profitable".